the property of solid bodies of irreversibly transforming into heat the mechanical energy imparted to them in a process of deformation. Internal friction is related to two different groups of phenomena, inelasticity and plastic deformation. Inelasticity. Inelasticity is the deviation of a body’s behavior from its properties of elasticity upon deformation in cases when residual deformation is practically absent. In the case of deformation at a finite rate, a deviation from thermal equilibrium occurs in the body. For example, during the bending of a uniformly heated thin plate consisting of a material that expands on heating, the fibers under tension are cooled, whereas the compressed fibers are heated; this results in the generation of a lateral temperature gradient—that is, the elastic deformation leads to a disturbance of the thermal equilibrium. The process of subsequent temperature equalization by heat conductivity is accompanied by irreversible conversion of a part of the elastic energy into heat. This explains the experimentally observed damping of the free flexural oscillations of the plate—the so-called thermoelastic effect. Such a process for restoring the disturbed equilibrium is called relaxation. The elastic deformation of an alloy with uniform distribution of the atoms of the various components may lead to redistribution of the atoms in the material owing to differences in their size. The restoration of the equilibrium distribution of atoms by diffusion is also a relaxation process. Elastic aftereffect (in pure metals and in alloys) and elastic hysteresis are also manifestations of inelastic, or relaxation, properties. The deformation generated in an elastic body depends not only on the external mechanical forces applied to the body but also on the temperature of the body, its chemical composition, external magnetic and electrical fields (magnetostriction and electrostriction), and grain size. This leads to a variety of relaxation phenomena, each of which contributes to internal friction. When several relaxation processes, each of which may be characterized by a corresponding relaxation time τ1, occur simultaneously in a body, the combination of all relaxation times of the separate processes forms the so-called relaxation spectrum of the particular material (Figure 1), which characterizes the material under the given conditions. Each structural change in the sample changes the relaxation spectrum. 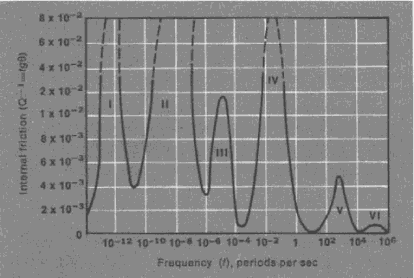 Methods used to measure internal friction include the study of the damping of natural oscillations (longitudinal, transverse, torsional, and flexural), the study of the resonance curve of forced vibrations, and the relative elastic energy dissipation during one vibration period. The study of internal friction in solids is a new, rapidly evolving branch of solid-state physics and is a source of important information concerning the processes occurring in solids, particularly in pure metals and alloys that are subjected to various mechanical and thermal treatment. Internal friction during plastic deformation. If the forces acting on the solid body exceed the elastic limit, and plastic flow occurs, it is possible to speak of a quasi-viscous flow resistance (by analogy with a viscous fluid). The internal friction mechanism in the case of plastic deformation differs significantly from the internal friction mechanism of inelasticity. The difference between the energy dissipation mechanisms also determines the difference between the viscosity values, which differ by five to seven orders of magnitude. (The viscosity of plastic flow, which attains magnitudes of 1013-1015 newtons · sec per sq m [N · sec/m2], is always significantly higher that the viscosity calculated from the elastic vibrations, which is equal to 107-108 N · sec/m2.) As the amplitude of the elastic vibrations increases, plastic shear plays a larger and larger role in damping these vibrations, and the magnitude of the viscosity increases, approaching the plastic viscosity values. Postnikov, V. S. “Relaksatsionnye iavleniia v metallakh i splavakh, podvergnutykh deformirovaniiu.” Uspekhi fizicheskikh nauk, 1954, vol. 53, part 1, p. 87. Postnikov, V. S. “Temperaturnaia zavisimost’ vnutrennego treniia chistykh metallov i splavov.” Uspekhi fizicheskikh nauk, 1958, vol. 66, part 1, p. 43.